Hawaii Native Status: Introduced. 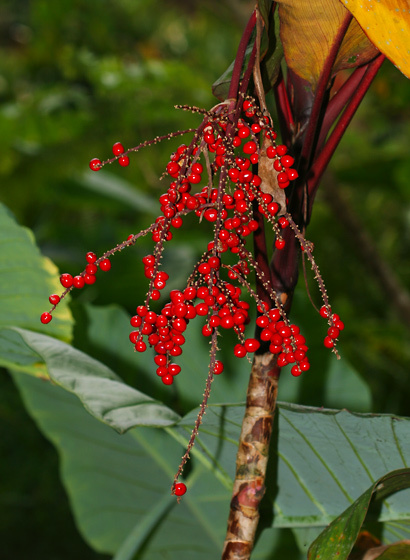 This naturalized Polynesian canoe plant and ornamental garden plant is native to parts of tropical Asia, Micronesia, and Australia. Description: The numerous small, 6-lobed flowers are in branched, drooping panicles. The flowers are sometimes followed by small, rounded, shiny, red fruit. Ti plants with green leaves rarely produce fruit and are instead usually propagated by stem cuttings. 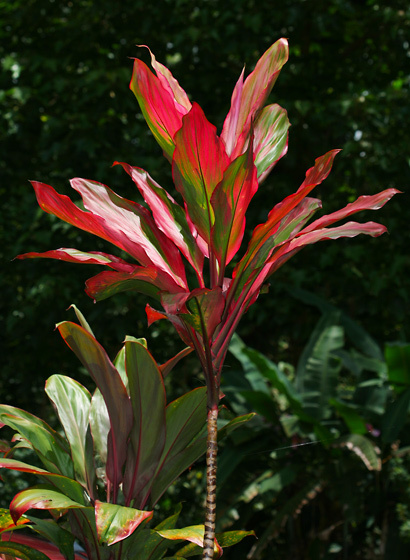 The leaves are smooth, hairless, lanceolate to oblong-elliptic in shape, up to 2 feet (0.6 m) long, alternate, and bright green, red, blackish red, reddish purple, pink, brown, or variegated with yellow, cream, or a combination of colors. The leaves are spirally arranged into a fanlike shape at the stem tips. 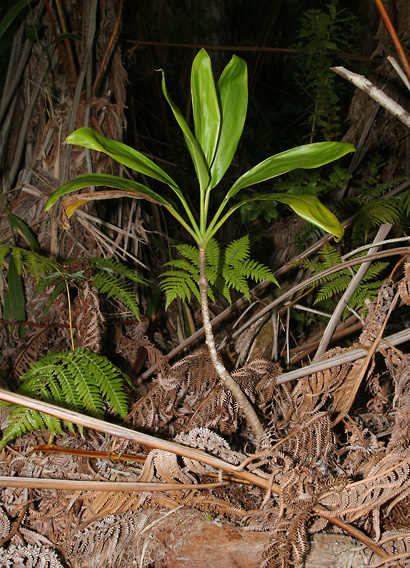 The stems are slender, upright, usually unbranched, and ringed with leaf scars. Here in Hawaii, Ti grows wild in wet to mesic (moderately wet) areas at low to middle elevations. 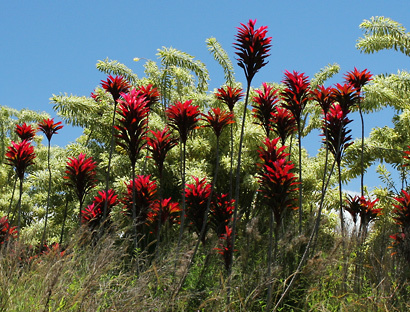 Ti is widely cultivated in Hawaiian gardens because it has attractive, often colorful foliage, is used in Hawaiian cooking, and is believed to bring good luck. 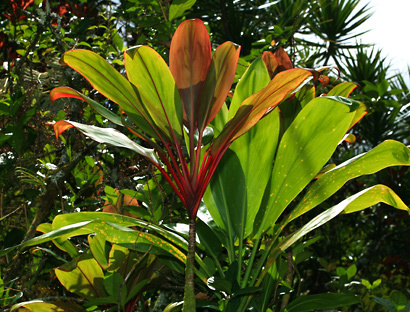 The leaves can be used in tropical flower arrangements. 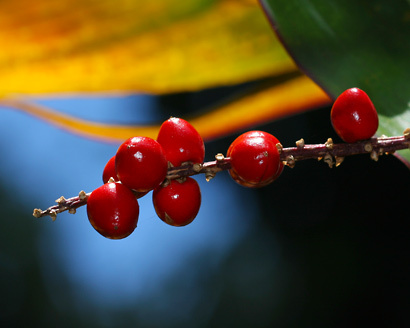 Canoe Plant – Ti was originally brought here to Hawaii by the ancient Polynesians in their canoes. Parts of the plants were used for various medicinal purposes. The large, flexible, long-lasting leaves were used as food wrappers, plates, cups, table coverings, rain capes, thatch, clothes, hula skirts, sandals, and braided into leis. The leaves were also used for various cultural, ceremonial, and religious purposes. The roots (actually tuber-like rhizomes) were baked and eaten or fermented into alcohol. Edible – Ti leaves are used as food wrappers for cooking food in an imu, a Hawaiian underground pit oven used to cook food for luaus (Hawaiian feasts). The sweet, starchy underground rhizomes can be baked and eaten. Fragrant – The flowers are fragrant.